Front of abdomen, showing surface markings for arteries and inguinal canal. The internal iliac artery (formerly known as the hypogastric artery) is the main artery of the pelvis. It is a short, thick vessel, smaller than the external iliac artery, and about 3 to 4 cm in length. It arises at the bifurcation of the common iliac artery, opposite the lumbosacral articulation, and, passing downward to the upper margin of the greater sciatic foramen, divides into two large trunks, an anterior and a posterior. 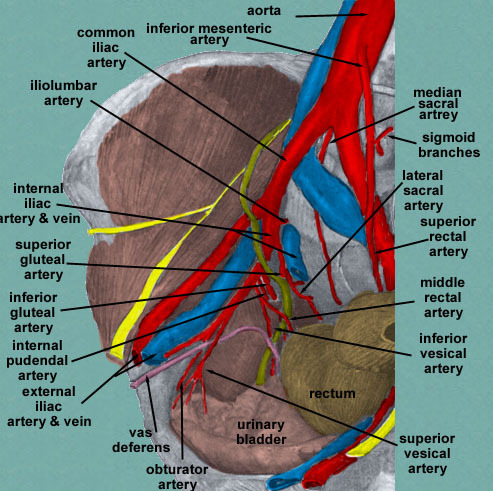 The following are relations of the artery at various points: it is posterior to the ureter, anterior to the internal iliac vein, the lumbosacral trunk, and the piriformis muscle; near its origin, it is medial to the external iliac vein, which lies between it and the psoas major muscle; it is above the obturator nerve. 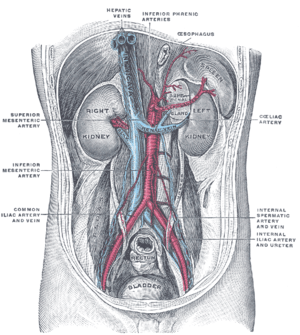 The exact arrangement of branches of the internal iliac artery is variable. Generally, the artery divides into an anterior division and a posterior division, with the posterior division giving rise to the superior gluteal, iliolumbar, and lateral sacral arteries. The rest usually arise from the anterior division. The following are the branches of internal iliac artery. Because it is variable, a listed artery may not be a direct branch, but instead might arise off a direct branch. Right (distal from spectator) internal iliac artery and branches, except for iliolumbar artery, umbilical artery, uterine artery/deferential artery and vaginal artery/inferior vesical artery. In the fetus, the internal iliac artery is twice as large as the external iliac, and is the direct continuation of the common iliac. 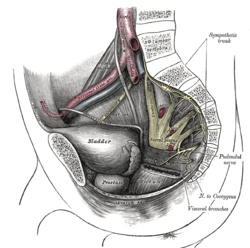 It ascends along the side of the bladder, and runs upward on the back of the anterior wall of the abdomen to the umbilicus, converging toward its fellow of the opposite side. 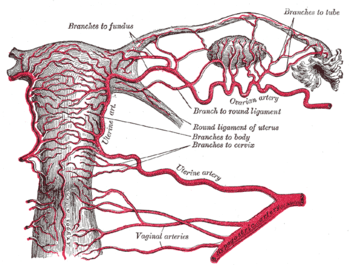 Having passed through the umbilical opening, the two arteries, now termed umbilical, enter the umbilical cord, where they are coiled around the umbilical vein, and ultimately ramify in the placenta. 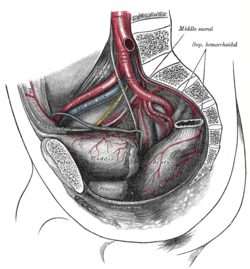 At birth, when the placental circulation ceases, the pelvic portion only of the umbilical artery remains patent gives rise to the superior vesical artery (or arteries) of the adult; the remainder of the vessel is converted into a solid fibrous cord, the medial umbilical ligament (otherwise known as the obliterated hypogastric artery) which extends from the pelvis to the umbilicus. In two-thirds of a large number of cases, the length of the internal iliac varied between 2.25 and 3.4 cm. ; in the remaining third it was more frequently longer than shorter, the maximum length being about 7 cm. the minimum about 1 cm. The lengths of the common iliac and internal iliac arteries bear an inverse proportion to each other, the internal iliac artery being long when the common iliac is short, and vice versa. The place of division of the internal iliac artery varies between the upper margin of the sacrum and the upper border of the greater sciatic foramen. The right and left hypogastric arteries in a series of cases often differed in length, but neither seemed constantly to exceed the other. Bifurcation of the aorta and the right iliac arteries - side view. 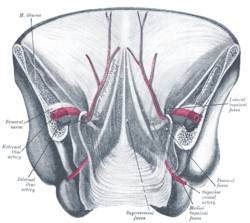 Dissection of side wall of pelvis showing sacral and pudendal plexuses. Sacral plexus of the right side. 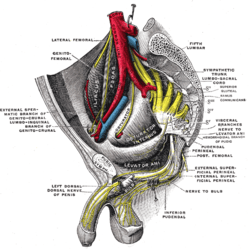 Posterior view of the anterior abdominal wall in its lower half. The peritoneum is in place, and the various cords are shining through. Posterior abdominal wall, after removal of the peritoneum, showing kidneys, suprarenal capsules, and great vessels. Pelvic contents: male. Superior view. Deep dissection. Lumbar and sacral plexus. Deep dissection.Anterior view.